I got this forwarded to me last week and it was a fairly busy week of posting, so it kept sliding back. But then the thought occurred to me: "What if one of the Tavern's readers were to miss out on this amazing opportunity because I failed to share it! They could miss out on the job of their lifetime and I'd be at fault." So, here it is - with commentary! Website Specifics: Customers can auto check out via paypal. Daily updates by staff for new arrivals and back issues. Subscriber options for people who want to be updated when a particular title is available; new arrivals are input, or specific product type is listed. Employee Pay is bi-weekly. Work environment is close knit, and friendly. (we will be sharing your desk) Must fit company dynamic, and be a team oriented individual. All top people in the company receive the same hourly wage (and 8 bucks an hour is the top wage - better stock up on Raman Noodles), so your hourly wage can increase, but your real income will come from your commissions. This is an ideal situation for an established website developer who can get us up and running fast, and understand the implications of being the person who gets the commissions in perpetuity (as long as you work for the company) (and if you start earning too much, I'll fire you and hire someone for 8 bucks an hour AND no commissions) for administering the website, and fixing the issues that arise as we grow. Our website will not be the cheapest price for anything (wait - that seems like an honest statement), but rather a completist site, with a devout-level dedication to customer service and brand loyalty. Here's the interesting part. 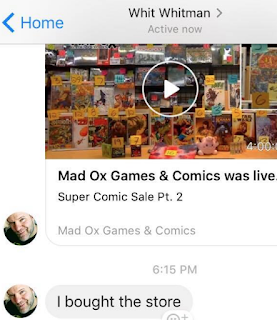 #ConManKen supposedly BOUGHT Mad Ox Games & Comics LAST month. Yet somehow Marcus is a "Senior Partner." Of a business that Marcus was about to close and somehow now expects to make $10m a year in online sales. Anyone else see what I see? A shell game and nothing more. $8 an hour? I could get that working in a gas station. I thought it was just one location of the store that Marcus was selling to Kenny-poo. Didn't realize it was the whole operation. Looks like that deal fell through eh? Big surprise. Working at Wal-mart pays more than that and is an honest job compared to this. Nothing says "Apply now while offer lasts" than a client who wants tens of thousands of dollars of web development for just-over minimum wage plus a percentage of an already failed business. At $4 a comic book, $10 million is 2.5 million comic books sold through the website each year. Is that realistic? Comichron (http://www.comichron.com/yearlycomicssales/industrywide/2016-industrywide.html) gives 2016 North American sales of $1.085 billion, so Marcus is shooting for 1% of the market himself. I'm feeling sorry for Marcus. 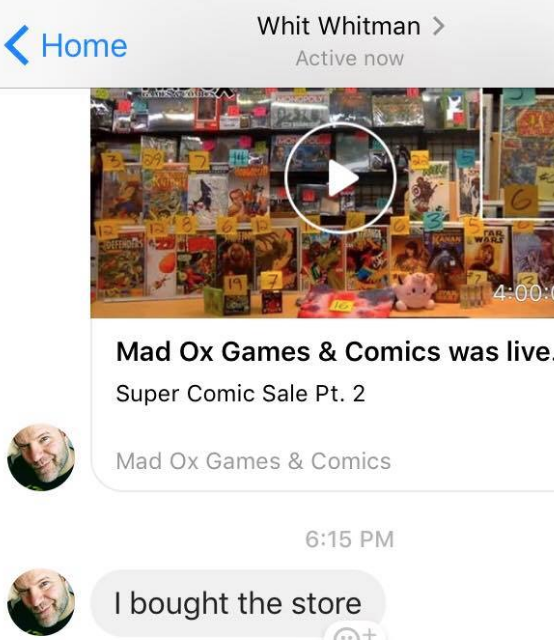 They think they can compete with mycomcicshop.com from Lone Star Comics? Um, yeah, good luck with that. Marcus just doesn't know what he's doing. Web Developers don't work for $8 an hour, I make many times that figure. Web Developers don't write product descriptions, oversee product or promote Websites. What Marcus needs is to contract with a Web Develoment company who can build him a Website that can be updated by a non-technical person. He can even buy a commercial Website off-the-shelf. Then he needs to hire a product manager or marketing manager to oversee the product, keep the Website up-to-date, take and post pictures and promote the company. If he's lucky, he'll find a kid with good skills who loves comics and needs the experience but he'll never find a real professional to fit that job description especially with what he's offering. Absolutely. I basically did this job for a company when I really, really needed the work, but even then I did it at a lot more than $8/hr, and I had it in writing that if I was even vaguely successful at doing all that work, I'd get a *considerable* raised within 3 months of starting, and another big raise after another 3 months. The funny thing is that it's probably cheaper to outsource the web dev and hire an in-house product person for minimum wage or close to it. The 'development' aspect aside. I've worked for comic book stores before that had 10s of thousands of back issues. Let me tell you, those are not going anywhere. No one is looking for X-Factor #23 and has been searching everywhere for it. Those get thrown into the 'free giveaway' bin for anyone who buys $.01 in other merchandise. New comics? There might be a bit of a market for online subs I guess. Not to the extent he imagines however. 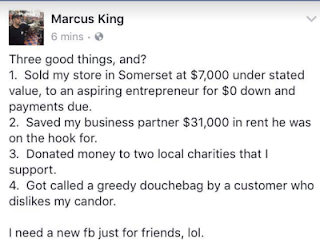 Marcus might have some idea about selling stuff (I think used to own Titan Games), but he's off his rocker if he thinks he is going to find a good web designer/webmaster/online sales manager/slave for eight dollars an hour. People make more than that working fast food. Hell, Wendy's - one of the lowest paying fast food chains - starts their basic wage slaves at more per hour.